We’ve just has our first heatwave of the summer, which has re-focused my mind on heatwave food, and some of the best hot weather food around is the humble coleslaw. I love a good slaw. My initiation into the world of food blogs came about when I was searching for a coleslaw recipe online and I came across this simple slaw recipe on Smitten Kitchen, which was the eighth slaw recipe Deb Perelman had posted. This was in 2008, so how many slaw recipes she’s posted since is anybody guess. This sweetcorn slaw from Ottolenghi is fussier than most: the corn is grilled, there’s an extra step of marinating the onions and cabbage in brine but it’s worth the extra effort because this slaw is a perfect special occasion, party-time slaw. Just the thing to kick you into the festive season, a worthy Christmas lunch, boxing day picnic, New Year’s celebration offering. I took this slaw over a friends place for a Sunday night barbie on the weekend. 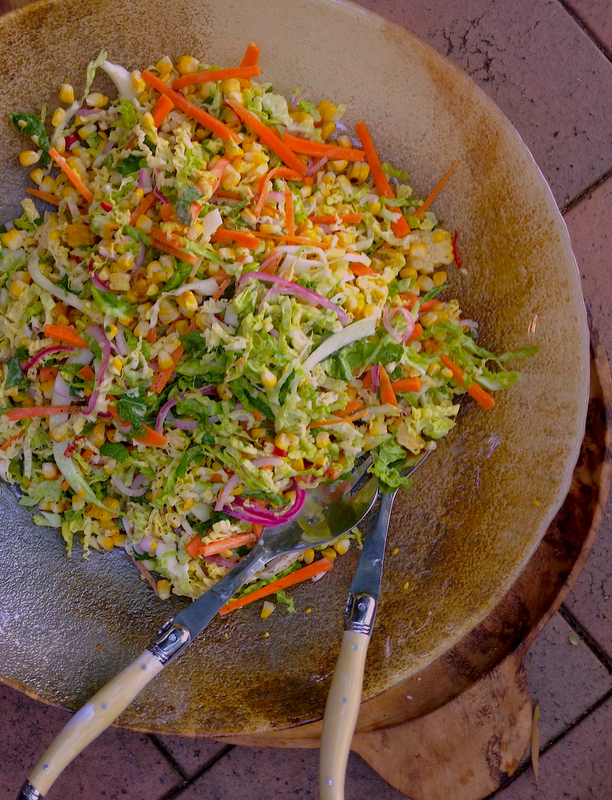 There was a bit of Thai–Lebanese fusion happening and this sweetcorn slaw happily bridged the gap between tabouli and Thai fried rice. It’s the time of year of festive potlucks and picnics, so a salad that can go the distance in our multi-cultural culinary melting pot is one to be treasured. I still don’t feel like I’ve come to terms with the new world order and the triumph of Trumpism. Most days, I feel like we’ve all slipped through the looking glass and we’re living out the end days in some weird alternate history novel. Things are getting really crazy now with the CIA’s statement on the Russian government’s involvement in the American election hack and Putin’s troll army pushing fake news and propaganda. It’s beginning to make Watergate look like a tiny storm in the tea cup. In these wild end times, I’m reading Teen Vogue for political analysis and I’ve become a born-again Madonna fan, or anyone else who takes a strong anti-Trump stance, I’m with them totally in feminist solidarity. I had my first picnic and ocean swim of the season last weekend and one of my friends said she felt she needed counseling to deal with the rise of Trump. We’re far away in Australia but it feels like the entire liberal democratic world is under threat at the moment, so I could totally get where she’s coming from. The swim and the picnic were restorative though: you can’t beat floating on your back in the ocean and looking up at the blue sky to find some perspective and beauty in the world. With so much horror in the world, I’m trying to concentrate on the light at the end of the tunnel, the patch of blue sky. My big patch of blue sky for the week was a remarkable documentary, Spirit of Place, about the Australian architect Glenn Murcutt and his design of a mosque for the Newport Muslim community in Melbourne. With all the Trump Triumphalism, Islamophobia, destruction of Aleppo and general end times darkness, this story of Murcutt and his collaboration with the local Islamic community to build a non-traditional, culture changing mosque was unexpectedly transcendent and moving. It gave me some hope that maybe, just maybe, if we pool all our collective humanity and decency together, we might get through this without blowing the entire planet up. If you’re in Australia, you can still watch Spirit of Place on ABC iView until 20 December, or you can read about it here. Mix together vinegar, 200 mls water and 1 tablespoon salt in a small saucepan and bring to the boil and remove from heat. Place cabbage and carrot in large bowl and pour two-thirds of the brine over it. Pour the rest of the brine over the red onion in a separate bowl. Set aside for 20 minutes. Place a ridged griddle pan or cast iron pan on a high heat and, when it is hot, place corn on it and grill corn on all sides until they begin to colour. This takes about 10–12 minutes and creates a lot of smoke so, put your extractor fan on or, alternatively, do it on the barbecue. Put corn aside and when cool enough to handle, shave the corn off the cobs and place in a large mixing bowl. Rinse vegetables and onions well, drain and pat dry and place in the bowl with the cooled corn kernels. Whisk together dressing ingredients and stir through salad. Add chilli, coriander and mint, gently mix through and season with black pepper. Your recipe sounds amazing. I can’t wait to try it. I also love your calm voice when the rest of the world is erupting in chaos. I believe that we have to continue to spread a positive message and not get sucked into the political sinkhole that is trying to take us all down!